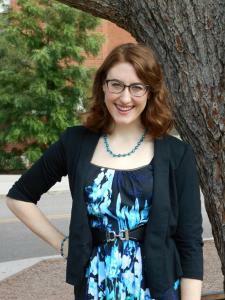 Dana R. Dinsmore is a fourth year Ph.D. student. Her research focuses on how communication in family and romantic relationships affects our physical and mental health. Her research addresses such topics as diet, exercise, alcohol/substance use, and medication adherence. She is just as passionate about teaching as she is her research, and she loves helping students connect communication course concepts to their daily professional and personal lives. Floyd, K., Dinsmore, D. R., & Pavlich, C. A. (2018). The theory of natural selection: An evolutionary approach to family communication. In D. O.
Braithwaite, E. A. Suter, & K. Floyd (Eds. ), Engaging theories in family communication: Multiple perspectives (2nd ed.). New York, NY: Routledge. Floyd, K., Pavlich, C. A., Dinsmore, D. R., & Ray, C. D. (in press). The physiology of affectionate communication. In L. S. Aloia, A. Denes, & J. C. Crowley (Eds. ), The Oxford handbook of the physiology of interpersonal communication. Oxford, England: Oxford University Press. Floyd, K., Pavlich, C. A., & Dinsmore, D. R. (2018). Physiological measures of wellness and message processing. In R. L. Parrott (Ed. ), Oxford encyclopedia of health and risk message design and processing. New York, NY: Oxford University Press.